I hope you don't like nicotine! 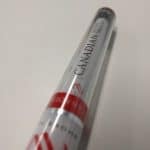 Smoke NV is a Canadian company trying to convince shoppers that nicotine-free e-cigarettes are the way to go. Let’s agree to disagree – but one thing is for sure, they’ve got the branding and marketing right. 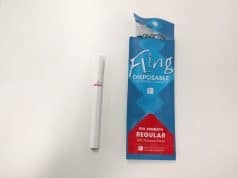 Since I figured many smokers could be interested in their products – after all, you can even get them in gas stations – I decided to buy a few and give them the review treatment. Let’s see how that goes with the (rather expensive) Smoke NV Disposable! The first thing that strikes you about the Smoke NV Disposable is its good looks: it’s gorgeous. Black and white with red accents is a real winner, and the size is appealing too. Overall, it’s classy, well designed, and not too big (especially for a disposable). It’s heavy however – about the same as a non-disposable KR808-based product, like the V2 Standard. That’s a drawback when you compare it to a Fling Disposable, which has a very lightweight plastic construction. Obviously, that makes it less comfortable for hands-free vaping. Vapor output is great (for a disposable). Throat hit, on the other end… Well, there’s no throat hit whatsoever. That’s because Smoke NV is trying to convince the world that nicotine-free e-cigarettes are safer, healthier and that during their testing smokers enjoyed it just as much. What has been discussed and is growing momentum is the harm reduction view within research. This is an acknowledgement of the fact that the use of an electronic cigarette is simply safer than the use of a traditional cigarette. Essentially for each puff of an electronic cigarette containing no nicotine you avoid a puff from a traditional cigarette. Obviously traditional cigarettes have been shown to cause cancer, heart disease, pulmonary disease etc. There’s nothing wrong with providing nicotine-free options – after all, nicotine isn’t good for you – but insinuating that nicotine is the cause for all those diseases you get from smoking isn’t so great. Worse than that: one year before making this statement, Smoke NV offered 0mg, 5mg and 10mg options. Believe me when I say that if I had started to vape with a nicotine-free product, I wouldn’t have lasted a day. Moving on to flavor: Unfortunately, the “Canadian Tobacco” flavor doesn’t taste like tobacco. It’s not bad, but it’s not that good either. The e-liquid has very bland flavor, but of course it could be much, much worse. My advice? 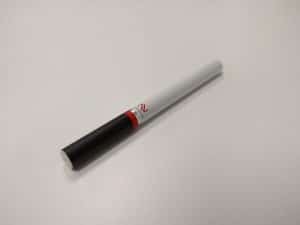 Don’t fall for the great branding and marketing hype – there’s absolutely no point in buying this product, unless you’re absolutely certain you don’t want or need nicotine (along with any form of throat hit). While the vapor output is great for a disposable, it's expensive, doesn't taste like tobacco and doesn't really help with cravings. What's the point? I’ve embarked on a smoking cessation program. 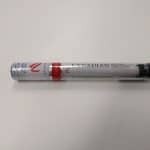 I searched numerous vapor e-cigarette selling stores and websites. I was absolutely stunned by the cost as well as how unsightly some of them were. I’m a glam ma’am lady. I want purple, not black with see-through innards hanging on a cord around my neck. 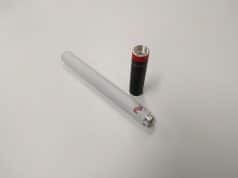 Originally the pull was to help cigarette smokers quit. NOW it’s about joining the ever-increasing fad of ‘vaping’. There are ‘vaping’ parties. Vaping night clubs are next. It’s a great bridge to form common bonds, unless you’ve just GOT to have the unit someone else has that is less costly than yours to continue. There are thousands of types and you can only buy the flavored oil vials that fit into your cylinder. The oils come in every flavor imaginable, including chocolate (great for PMS’ing ladies), pina coloda, or any flavor the roof of your mouth and tongue can languish in for, oh let me see, about 10 seconds. I might not feel like ‘vaping’ on my fav flavor all day. I don’t want to carry extra oils and a charger just in case I end up at a week-end party. There is a continuing cost to buy flavored liquids and coils that need to be replaced. If you’re someone who forgets to charge your cell phone, or loses your keys, or accidentally leaves things at your last location, you might be on a sure road to frustration. 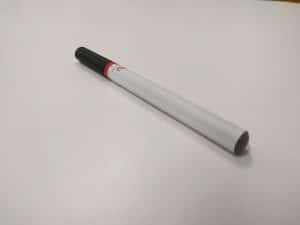 My ‘quit smoking’ strategy includes the use of less costly DISPOSABLE e-cigs that look similar to cigarettes, give me the feel of holding a cigarette in my hand, provide some comparison to drawing in cigarette smoke without flavors that can become addictive. I’m also using ‘smoking cessation’ aids like low-dose nicotine gum and nicotine patches that slowly reduce the amount of nicotine needed to feed the habit. They are cost free through a government program. How do I know this? Because I’m doing it right NOW and doing GREAT! The smoke NV I picked up today from cornerstone DO not buy! Was 13.99 and lasted two hours was either old or just plain garbage. Bough pomagrante was awful, cheap piece not crap! I am very disappointed that London Drugs have not carried this product for over a year now. Where else can I purchase this?